Some great masters exist undoubtedly in this world, unfortunately, they are few. One of these masters is Kari Voutilainen. 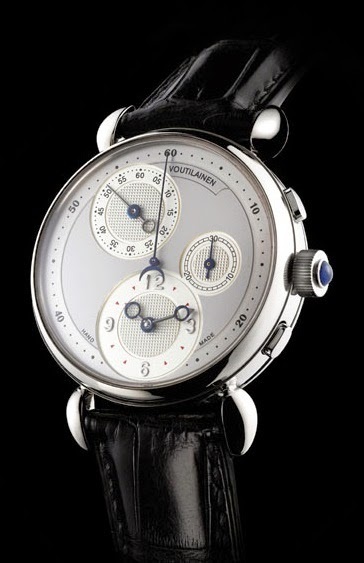 I decided to shortly present some of his work/creations – the Chronograph series. 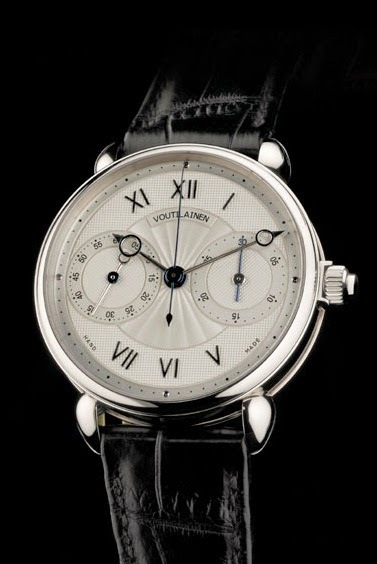 On his website http://voutilainen.ch/site/the-watches/ we can find 3 pieces: Masterpiece Chronograph, Chronograph Monopoussoir and Masterpiece Chronograph II. The Webster dictionary defines a masterpiece as: “a work done with extraordinary skill; especially: a supreme intellectual or artistic achievement“. 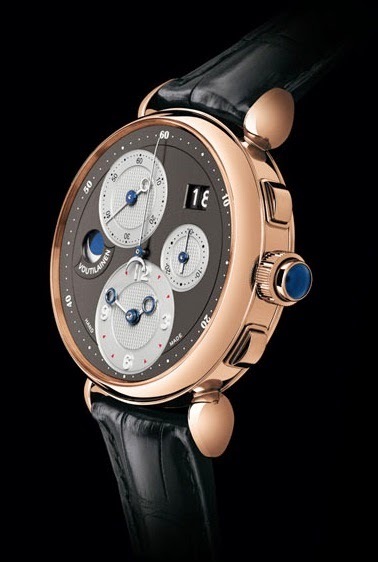 I couldn’t agree more as a definition for Mr.’s Voutilainen watches. His work combines beautiful technical thinking and beautiful handcrafted art. In these times of gadgets and smartphones, the watches tend to become more as a beauty accessory, but I, personally, I am still looking at my watch when I want to know the time, even in front of my computer or smartphone. 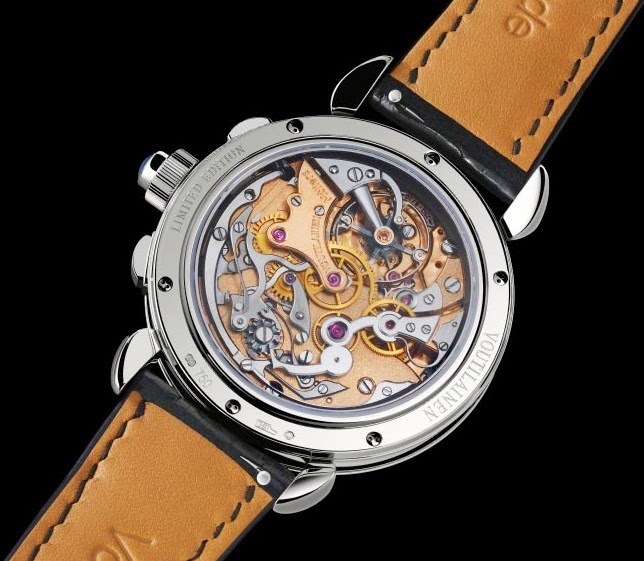 I love to watch the hands moving and chronographs are quite something to look at. It’s fun to push buttons, I love buttons. The in-house design features 30 minutes counter and seconds for chronograph and hours, minutes and seconds for time. 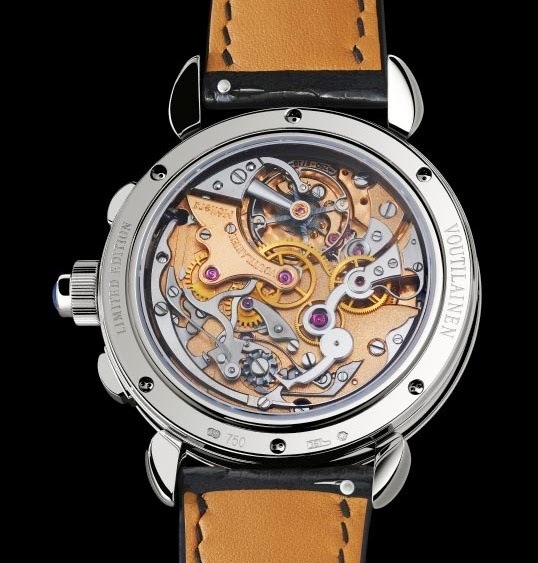 The hands are from steel and gold on a 30mm movement in a 39mm case size. The 18-karat gold engine turned dial, finished in white eggshell with applied numerals and indexes features at 6 o’clock the hour and minutes. The seconds are easy to view at 11 o’clock position while the seconds counter for chronograph has the main place on the dial and the 30 minutes counter is positioned at 3 o’clock. The subdials have very beautiful and discrete guilloche patterns. The back view of the mechanism is simply fantastic: the bridges are plated in 18k gold, the face of the plates and bridges have a frosted finish while the sides are angled and polished offering a nice contrast. The main bridge has two inscriptions: Voutilainen and Motiers (the place of birth of this watch). The heart of this masterpieces beats with 21.600vph and has a power reserve of 55h, manual wounding. This mono-pusher chronograph is built in a very small series of 4 pieces and also features a 30 minutes counter. The dial is well balanced with two subdials with guilloche patterns: one for seconds at 9 o’clock and one for the chronograph’s 30 minutes at 3 o’clock. 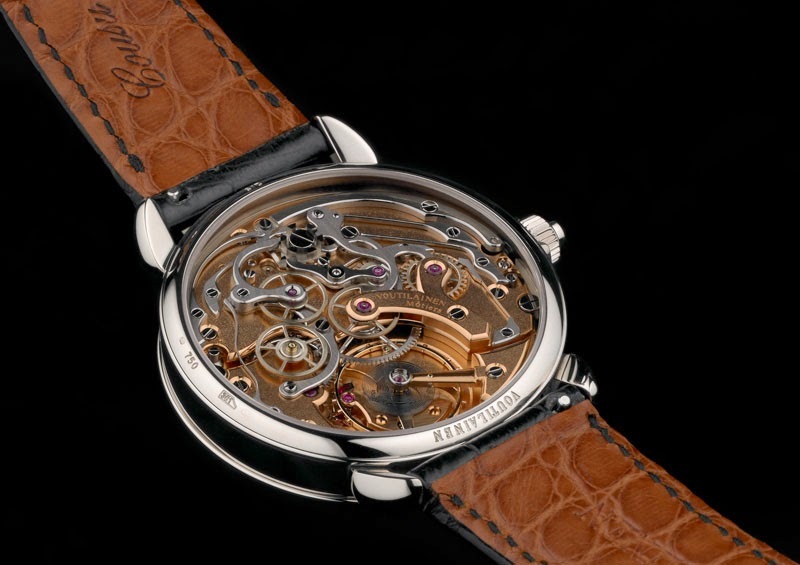 The bridges and plates have the same frosted faces and polished edges and the movement is mounted in a 43mm case also manual wounding. In my opinion, the mono-pusher chronograph is a great complication and the visible movement offers a great way to study it. This 30 minutes chronograph has counter minutes at 3 o’clock and counter seconds in the main dial, times hours and minutes at 6 o’clock, seconds at 11 o’clock and date between 1 and 2 o’clock. The hands can be found in a combination of blue steel, white gold and yellow gold and the dial in gold, guilloche, in various finishes. The back side with visible movement in 30mm size offers the same beautifully handcrafted finishes with frosted and polished shapes. The case size, in white or yellow gold, is 40mm. In the end, the chronograph is a useful thing, even for boiling eggs (but those eggs will surely taste fantastic) and in any version (mono pushers or not) they are highly desirable between watch lovers. If you have a chronograph just go play with it for a while. It’s nice! Isn’t it? If you don’t have one, go buy one. I can guarantee that you will have a lot of fun.